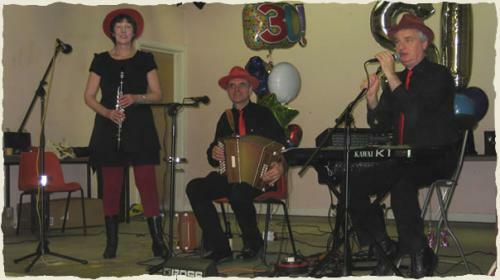 The band-Jan, Roy, and Nigel have been playing for /running dances for many years. A professional trio they take a pride in providing good quality entertainment at weddings and party dances for all ages. Jan,the caller, runs through most popular dances including traditional classics such as The Virginia Reel, Cumberland Square Eight and Strip the Willow - good for beginners. She also calls American contras and sung squares - and novelty dances such as the Lambeth Walk and Rock Barn Dance. The type of dance will depend on the event - and on the age and experience of the dancers. Their music originates from England, Scotland, Ireland and America with lively traditional polkas, jigs, reels, hornpipes and gentle waltzes - ideal for dancing. The trio also perform songs and include in their repertoire Irish songs for St Patricks Nights, Scottish for Burns nights, American for a hoe down, and a variety of lively songs from the Music Hall era and 30s and 40s and even some Rock and Roll.